Basics: The first thing you notice about the 18-200mm DX lens is that it's rather small for what the specs say it can do. Where the heck is the 200mm and VR stuffed in? After all, this is a lens that's smaller and lighter than most previous mid-range DX zooms Nikon has made. The 18-200mm focal range gives you angle of views from 8 to 76 degrees on a DSLR; it's effectively the same as using an 28-300mm lens on a 35mm or FX body. For some users, that's a stay-on-camera range. There's no denying that this is a much-asked-for focal length range. This is a two ring design; like many recent consumer Nikkors, the zoom ring is the front most ring and the focusing ring is closer to the camera. Yuck. The lens does have a distance scale, but with no depth of field or infrared markings. For that matter, we only get three markings other than infinity for feet, and three in meters. Manual Focus button: In the M/A position the lens works as usual (autofocus with manual override). In the M position, the lens focuses only manually. VR switch: VR can be turned On or Off. VR type: VR can be set to Normal or Active. 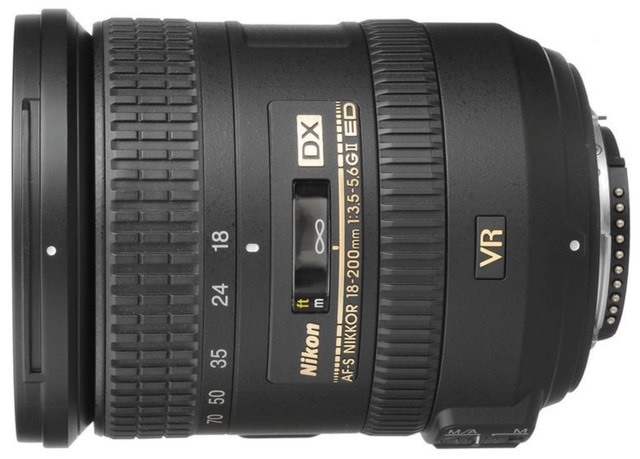 VR is specified by Nikon as being VR II—this new variant supposedly gives a bit more range to the VR usefulness. In Nikon's literature, they claim that VR II manages to get you four stops beyond what you'd normally be able to handhold. As far as I can tell, that's a valid claim at 200mm. But, be forewarned that VR is often much less useful than you might think. When you start hand holding a lens at 1/30 or lower, you're definitely going to be fighting subject motion. If your subject is absolutely static, fine, no problema as my South American friends like to say. But most of the folk that'll be using this lens aren't shooting completely static subjects with it, I think. The primary use for VR on this lens in my mind is to keep you from having to significantly boost ISO in common situations at 200mm (which would be f/5.6 maximum aperture). If the choice at that focal length were between shooting at f/5.6, 1/300, and ISO 1600 versus perhaps f/5.6, 1/60, and ISO 400 and I wasn't shooting a moving subject, I'd pick the latter just to keep noise under as much control as possible. What VR (or VR II) won't do is to allow you to shoot your daughter's night soccer game at 200mm and 1/15. That's a recipe for fuzzy players on sharp grass. The HB-35 hood supplied with the lens is the bayonet type butterfly style. It can be reversed onto the lens for carrying, but it adds significant diameter to lens when you do so. It's a bit shallow, so doesn't present a lot of shading for the front element from the sides, but it's far better than nothing, and it is more substantial than some of the butterfly hoods that have appeared for other Nikkor lenses. The lens itself uses 72mm filters, an odd size for Nikon and one that'll force almost everyone to buy a step-up ring of some sort (I use a 72-77mm step up, as my primary filter set is 77mm). For the consumer target of this lens, though, the filter size isn't a big deal, as this is likely to be their only lens, and thus they'll just buy 72mm filters. You get AF-S focusing with this lens, and that'll take you down to a bit over 16 inches (.5m) at most focal lengths and a bit over 14 inches at 18mm. For those of you who keep track by magnification, that's about 1:15 at 18mm and about 1:4 at 200mm, both pretty good figures for a superzoom. The supplied lens cap is the pinch-front type. Finally, one word about focal length. As with most zooms, focus point shifts the focal length a bit. At infinity, the lens is 18mm at its wide end, and I think a few millimeters short of 200mm at the tele end (190mm or so). At very close focusing distances, which is where I'm at most of the time, the lens is almost down to 17mm at the wide end, with very little perceptible change at the tele end. Perfect! Just the way I want it to be. Handling: Handling is not the strongest point of this lens, though good enough for the target audience. The zoom ring is stiff and has a very different feel at different focal lengths (I should note that some users claim it is loose and subject to zoom creep; that isn't the case on my sample). As you zoom in to 200mm, the zoom ring has a sudden "loose point" just before you get to the maximum focal length. Zooming the other direction is smoother, though still what I'd call rough. The barrel extends almost two-and-a-half inches (6cm) at 200mm, so you're moving a fair amount of plastic and glass during the zoom. The barrel doesn't rotate during zoom, which means that you don't need to readjust filters. The focus ring is better than the zoom ring, though it's thin and has nothing to distinguish it in feel from the zoom ring other than position and width. Remember, the focus ring is not in a "normal" spot, and this takes some getting used to if you're coming from the standard 35mm Nikkor lenses. Focal length changes slightly when you're shooting at close distances. As with most modern "zoom" lenses, this is really a vari-focal lens, so you should be focusing after framing; I don't see this as a big deal. The 18-200mm is pretty small and light for its range. It balances well on the front of most DX bodies. The switches are well located—as long as you can remember which is which—and can be easily moved from one position to another without looking away from the viewfinder. Still, I would have liked a bit more differentiation in feel so that I could tell by touch which is the focus on/off and which is the VR on/off switch (the VR type switch is smaller than the other two). Even something as simple as a round raised point versus an X raised point would have been welcomed. Sharpness: Here’s the thing, time has revealed the 18-200mm to be an under-performer. At the time I wrote my original review, the 18-200mm matched up extremely well with the 6mp and 10mp cameras (it was introduced with the 10mp D200). Even with the VR II refresh, though, this lens shows some real issues with the 24mp DX DSLRs (and even the 16mp/20mp ones). Center frame performance is excellent out to about 100mm, and only very good beyond that. This lens is best at 18mm and worst at 200mm, with a slide downwards in sharpness as you zoom in. The problem with sharpness is that the corners are soft, and never reach the level of very good. In some cases—wide open as you zoom in—I’d consider them poor on the higher megapixel DX bodies. The killer is that the 18-300mm DX lens does a better job from 18-200mm on these cameras (though it’s a larger and heavier lens). At 18mm, f/5.6 and onward are very good across the frame. At 24-50mm you’ll need to be at f/8 to get to similar levels of performance. From 50-150mm, only f/11 really gets close to the maximum level this lens can produce, though by the time you get to 200mm, f/8 is just as good again. The problem, of course, is that at f/8 you’re pushing at more visible diffraction with the 24mp sensor DX bodies. Distortion: this lens produces considerable distortion across the entire focal length range, with high barrel distortion (4%+) at 18mm, moderate barrel distortion (1%) at 24mm, and moderate pincushion distortion from 50mm onward. Vignetting: The only real problem is wide open at 18mm, where you’ll find a bit more than a stop of vignetting. At 100mm+ and wide open, this drops to about two thirds of a stop. At virtually every focal length and aperture, vignetting is well controlled. Chromatic Aberration: Persistent and visible CA is seen throughout the focal length and aperture ranges, ranging near two pixels with the 24mp cameras. Overall: The sad news is that time has passed this lens on. The 18-105mm, 18-140mm, and 18-300mm all outperform it on 24mp DX bodies, and thus are better choices. If you’re still using an older 12mp body, you may find the lens much more to your liking: most of the issues I describe are much more subdued and mostly ignorable (other than distortion, which is going to be the same no matter how many pixels you have).